I’m no expert on the anti-plastic movement, but I do know it’s out there. I’ve read enough magazine headlines while standing in the checkout line to know that Glass = Good. Plastic = Poisonous Cesspool of Cancer-, STD-, and Alien Baby-Causing Chemicals. I still have perfectly good chip-free, stain-free plastic storage containers that I’m not ready to just toss. Glass food storage is expensive! I’m getting around #1 by continuing to use my perfectly good plastic to store food that doesn’t need to be reheated, and I’m getting around #2 by getting creative! I have about a 2 second window between realizing “I could use this for something” and coming up with exactly what that “something” will be, or else that item must be evacuated from my house. Lucky for that applesauce jar, I thought of it! Kate’s empty glass applesauce jar—an object created to hold food—can be used as glass food storage! 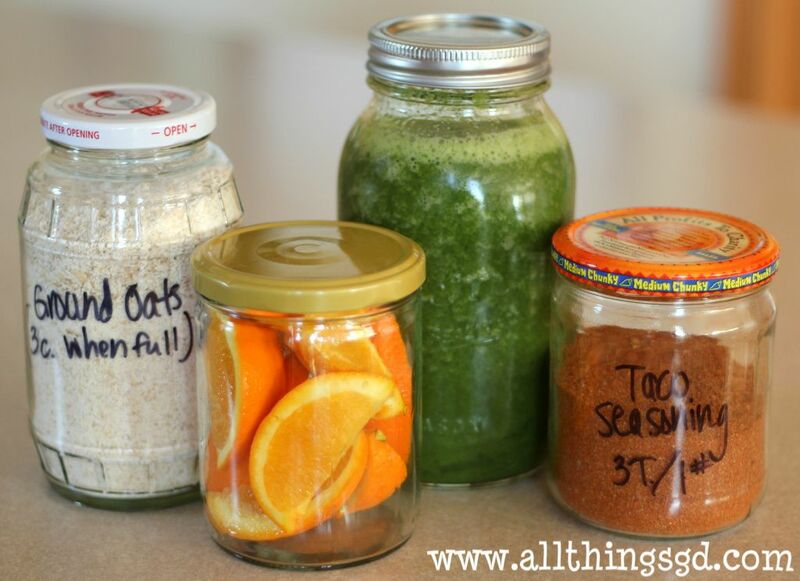 Ground oats for Kate’s Oatmeal Drops in an applesauce jar, orange slices in an artichoke hearts jar, Green Smoothie in a honey jar, and homemade taco seasoning in a salsa jar–just a few of the many things I store in glass these days! The great thing about reusing glass food jars (other than their $0 price tag!) is that they can go straight from the fridge to the microwave for re-heating. I’ve even been using them for freezing batches of soups and sauces! 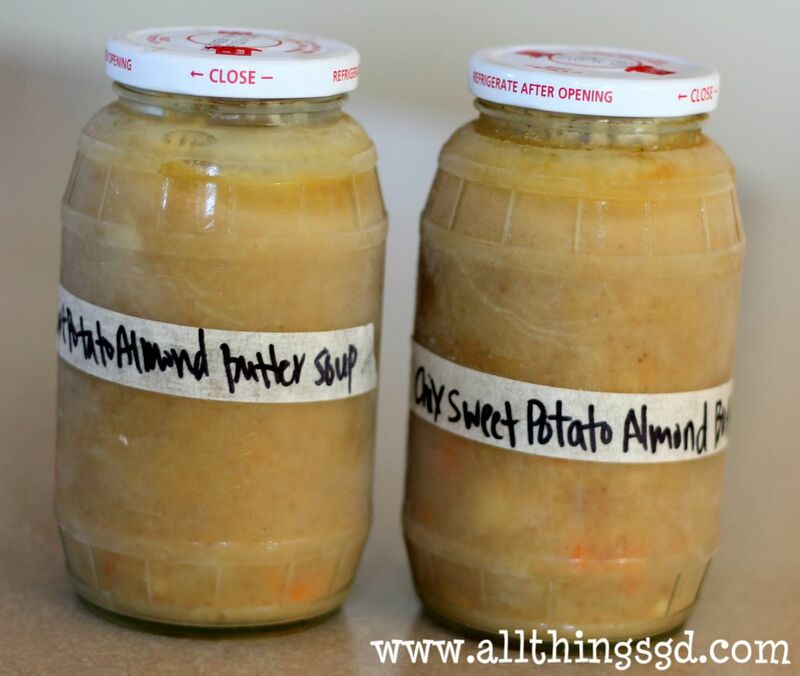 Almond Chicken Soup with Sweet Potatoes, frozen in applesauce jars. I fill the jars almost to the top (leaving space at the top since liquid expands when it freezes), and refrigerate it first to get the jar and its contents cold. Then I set the jar upright in the freezer with the lid off, wait until the contents freeze, and then put the lid on the jar. Large jars (like applesauce jars) work great for freezing 2 servings of soup, and small jars (like salsa jars) are the perfect size for freezing single servings! 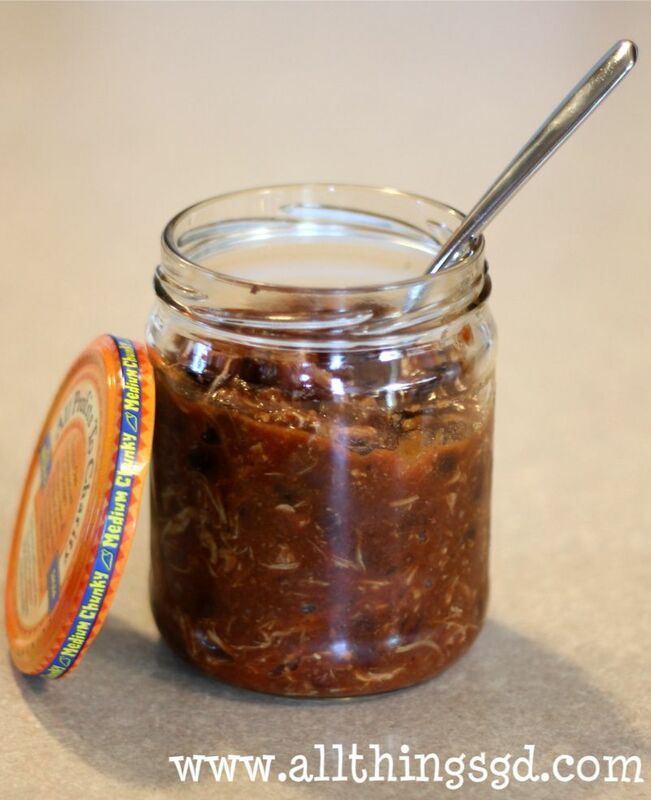 I love grabbing a jar of chili from the freezer, transferring it to the fridge to thaw, and bringing it to work for my lunch, heating it up, and eating it—all from the same jar. It makes a great grab-and-go lunch during the busy work week! Chicken Taco Chili in a salsa jar–a single serving grab and go lunch! Have I convinced you to covet all things glass in your house yet? If not, send all that glass goodness my way—I’ll put it to use! Ooooh I like it! One question though…do you have a trick for getting the stickiness from the labels off? Brilliant! I’ve been trying to convince my hubby of the health benefits of going plastic-free for several months now — perhaps reusing glass food containers (and not buying all new food storage) will help! What a great idea! I especially love the idea of freezing single servings for lunches. Fabulous post! Brilliant! I actually reuse glass jars for my hubby’s bazillion nails/screws/whatever collection. Easy to see what kind it is. Slowly we are getting his out-of-control collection organized! I’m with Tracey on this one – how do you get the stickiness off the glass jars? I’ve been doing this for awhile, but I still haven’t found a great way to get rid of that pesky glue. Goo gone works great, and it really just orange scented fish oil, can you believe it!? You are a genius. Yes, I too now covet. What is wrong with me that I have not thought of this before? Love this idea! (And many others…I’ve been reading your blog for awhile, but this is my first comment.) Question, though –are you sure these are safe to microwave? I know some types of glass are vulnerable to smashing to bits when subjected to the microwave(hence, the beauty of Pyrex…). Regardless, I’m definitely jumping on this bandwagon! Great idea! The Chicken Taco Chili looks yummy, is the recipe similar to the skinny taste minus corn? Thanks! This is a wonderful idea Dusty!! I too, have been meaning to buy the glass food storage containers but am also waiting until my current plastic ones get a little more use before tossing! Lucky for us, we don’t have a micro so we never reheat in the plastic…still tho – don’t like the plastic! Thanks for sharing these ideas! Love them – especially for freezing! Good work! A couple months ago I donated all but just a few pieces of my plastic storage and bought two 20 piece sets of pyrex glass storage. I’m never looking back – I absolutely love my glass storage containers!! Great thinking on repurposing those containers! @Tracey–I never really thought about it, but now that you mention it I run my jars through the dishwasher and slide the labels off when the load is done. That seems to work pretty well! I do have a couple of jars with one line of stickiness still running up the back but it’s not enough to bother me. @DianeTaylor–Another great idea, thank you! @jbhat–You’re right, I definitely need to think of something to do with those! I’m on it. @Tricia–That’s an excellent point. I typically heat in the microwave at 50% power, but I would definitely say heat (and freeze) at your own risk. If you’re worried about your glass jars not being able to handle it then it’s better safe than sorry! They should hand out Pulitzers for this– it’s one of those common sense solutions that takes a stroke of brilliance to figure out. Definitely pinning this one to my “Good Ideas” board so I’ll remember to do it! I adore this idea- but I am hesitant to do it because I have heard that all those caps are lined with BPA (same with canned food cans and canning mason jar caps). The glass part is awesome but I wish there was a BPA free solution to the caps. I’ve been a jar-hoarder for the past year… And they are fantastic. I use them as vases.. Storing sugar.. And lately I’ve been saving them for wedding decor. I found a fantastic tutorial for frosting them with Epsom salt to use them as candle votives! Great tips, Renee–thanks for sharing! My Mom used to spray paint the lids and they held up fine in the dishwasher. That would be so cute, britt! You’ll have to let me know how it turns out if you decide to give it a try! Happy to hear it, CC! Great, thanks for the advise. I’ve been saving glass jars but reluctant to freeze in them. Now I will give it a shot!! I hope it’s as successful for you as it has been for me, graceyb! I love saving jars. You’d be surprised how many jars out there will fit a mason jar lid. And if it fits a mason jar lid on it, it will fit most blender blades and collars on it so I can make your green smoothies in my take-out glass -an old “maries ranch dressing” jar- for easier cleanup . I even punch a hole in the mason jar top for my straw. I love being able to leave them somewhere or give them away without a care. Oh wow, Shannon – what a neat tip! I used mason jar lids for other jars already, but I’ve never heard about blending it right up in the jar like that. That’s amazing! !